Palace Pets is a great color ful fun loving moonwalk for kids of all ages. 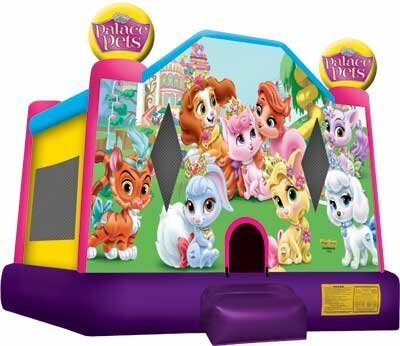 For that Pet Lover in the family they will love the Palace Pets themed Bounce House. The bouncy castle is the ideal way to combine fun and healthy activity, and will add great value to your special event With a variety of colors, shapes and themes, our moonwalks offer kids of all ages exciting aerobic activity. This large jumper has 360-degree mesh windows, so parents and spectators can have a clear view of all the fun. Our bouncy houses are made safe and secure with lite n strong fabric.